haha this is awesome! 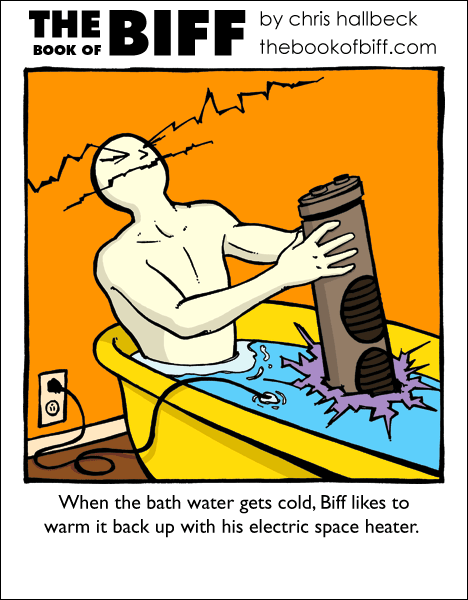 i particularly how you did biff’s eyebrow’s in ZAP mode. 😛 you rock chris, keep em coming! Love how the plug is upside down. Really? I live in an old house… that’s what they look like here. I live in a new house, and I have both ways. I think it was just the contractors having fun. Either that, or plugging in the wrong form of plug will do something similar to the clockwise-toilet, counter-clockwise-plumbing idea. Doesn’t it make more sence to put it “ground down” so when the plug falls out the ground is the last connection to break? i always thought they were upside down because sometimes its easier for the cord to reach like that or somthing… course that was in our ratty highschool.. The ground is generally slightly longer than the prongs. It will be the last to come out anyway. This way, it also makes the plug less likely to actually BREAK the ground prong when someone steps on the wire. oh, god lilwhytwch. that DOES look wrong! Zomg, Biff’s got MUSCELE. His head looks…. …… in comparrasion! EWWWW!!! WHY WOULD YOU THINK THAT?!?! Aaahhhh. Toasty warm bath. It makes me tingle, and twitch. Chris…you ought to be more careful…who knows what people may think! And I thought I was perverted! lilwhytwch, I bow before you. And I agree with Warcrime, I thought he was trying to filter his water. Imagine a little toddler playing with a knife/fork/spoon near an electrical output… Would you prefer him/her to put the metal ustensile on the ground part of the plug or on the electrified part of the plug… So that is why plugs are now installed ground up, for safety purposes. Actually, in new homes, all the outlets should face ‘upside down’ so that, if the plug is halfway-out and a piece of metal or some other conductor falls, the two prongs aren’t shorted, since the ground prevents any conductor from touching both prongs- unless the sideways gravity strikes again!! Sounds like a good Idea. Wow I can always get help with daily problems from biff! Just started reading these, and it scares me how similar Biff and I am. Like when I accidentally blew up my sink because I didn’t know my toothpaste brand was flammable. Or when I tripped down the school stairs, did half a backflip and landed in the garbage can. It’d be tragic if it weren’t so darn funny. Hmm… Does that really work? OW OW OW OW OW OW OW OW!!!!!!!!!!!!!!!! !